I was commissioned by the American magazine, The Cook’s Cook, to contribute again, this time to their travel issue, which was published on December 1, 2015. In it I wrote about Island Dining Above Victoria Falls. You can read the original magazine piece by clicking here. For those with slow internet connections, I have reproduced the story below. 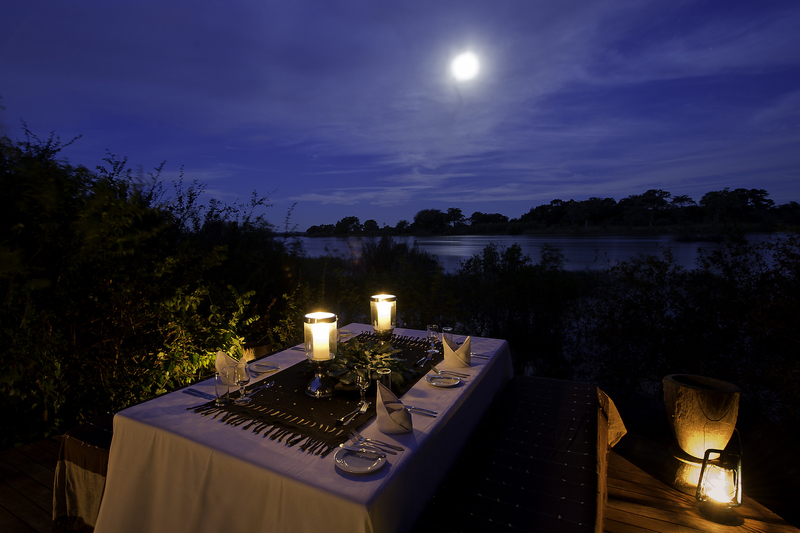 Dining under a full moon on Sindabezi Island, just above Victoria Falls. Photo credit: Tongabezi Lodge. I live a short distance upstream from the largest curtain of falling water in the world. In high-water season nine million cubic meters cascade over Victoria Falls in a second. Such is its force on a clear day we can see the plumes of spray-smoke rising high into the sky all the way from our farm, 20 kilometers upriver. Victoria Falls—or to the indigenous Tonga people, Mosi-oa-Tunya, “the smoke that thunders”—is the stupendous masterpiece sculpted by the Zambezi, a river so abundant and so powerful it has crafted the livelihoods and culture of nearly everyone who has settled on, or close to, its banks. And to some degree that includes us: my partner, Chris, couldn’t have started farming in the Zambezi Valley twelve years ago had he not had access to this vast resource. While we are appreciative newcomers to its banks, the Zambezi River has been intrinsic to different indigenous people’s identity for thousands of years, dating all the way back to the Stone Age. Today some continue to make a living from fishing and seasonal riverine subsistence farming, while others have recast their innate knowledge of this formidable river into the hospitality industry that caters to the thousands of tourists visiting Livingstone each year. 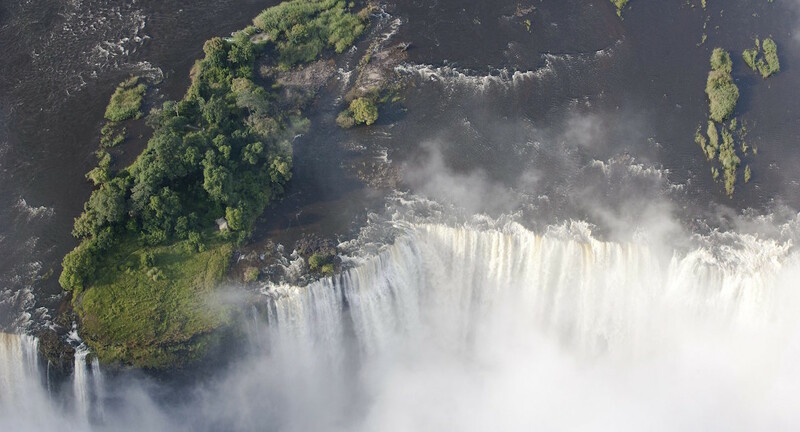 David Livingstone first viewed Victoria Falls from an extraordinary vantage point. Paddled in a makoro, or dugout, to an island in the middle of the river, which from the air looks like it’s sliding right over the edge of the falls, Livingstone was able to step right up to a rocky edge to marvel at what would, in later years, be listed as one of the Seven Natural Wonders of the World. Livingstone Island on the edge of Victoria Falls. Photo credit: Tongabezi Lodge. Today, when the Zambezi River is at its lowest, before the onset of the summer rains, visitors to Livingstone Island, as it is now called, can also walk right up to that rocky edge and marvel at Victoria Falls. Even better, they can eat there too. Visitors can sit down to breakfast, lunch or high tea, served al fresco under the trees, a few feet away from the roaring water. Much of the food is prepared on-site, which has its challenges: think migrating elephants crossing the river between Zimbabwe and Zambia after dark. I recently saw pictures of the island’s kitchen—a simple bush kitchen that during the day turns out, among other things, countless fresh salads, tartlets, profiteroles, and cucumber sandwiches—which had been upended and torn apart by a herd of elephants crossing the river. The kitchen was rebuilt and the island opened for business before the first breakfast was served the following morning. There’s a hint of otherworldliness dining on an island above Victoria Falls, knowing you are in no-man’s waters, suspended between two borders. 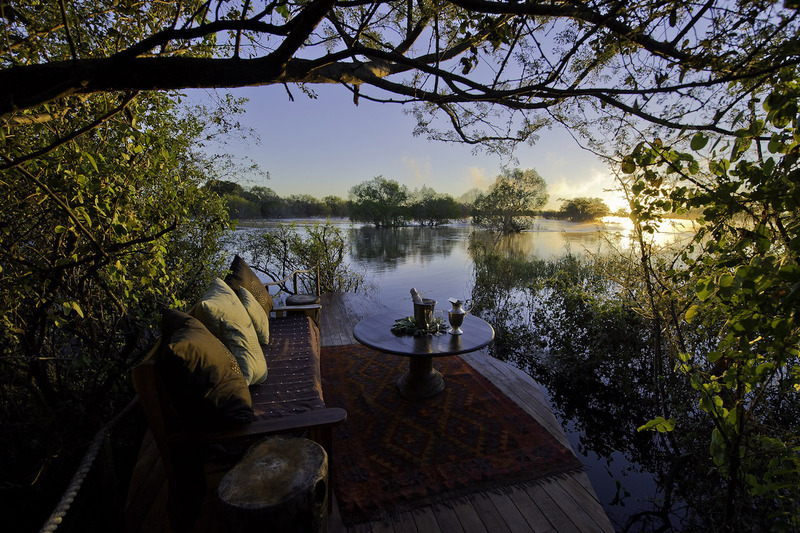 While it induces a sensation of calm detachment and romance, the menace of the Zambezi River—with its resident crocodiles and bad-tempered hippos; its underwater currents and basalt rocks hidden just beneath the surface—adds a frisson to the experience. Tongabezi Lodge’s Sindabezi Island, a short distance upstream from the falls, is an exclusive tented camp that accommodates a maximum of 10 people. With an on-site kitchen and designated chef and staff, the island has a feel of a sequestered castaway retreat. You can either dine in the privacy of your tent, at a table on a platform suspended in the canopy of trees, or on a sampan on the water. There are views of the river and its singular birdlife, as well as the nearby Zambezi National Park where herds of elephants, antelope and other game congregate each evening to drink at sunset. “The Smoke that Thunders,” seen from Sindabezi Island. Photo credit: Tongabezi Lodge. With my arrival in the Zambezi Valley nearly three years ago, wild edibles became an integral part of my own recipe development. The Zambians with whom I work have, over time, shown me just how much there is to eat in the surrounding bush. But as far as I could see, neither the safari lodges nor restaurants were taking advantage of this unique resource until, that was, I ate at Royal Chundu Lodge’s Katombora Island, a 30-minute boat ride upriver from our farm. Sitting at a table under a 2000-year-old Jackalberry tree on Katombora Island, Chris and I were served Sungani’s Zambian Cultural Tasting Menu, which he’d paired with different South African wines for each of the six courses. “To me, these dishes represent Zambia,” he said. A Munkoyo cocktail, part of the Zambian Cultural Tasting Menu served to us on Katombora Isand. Photo credit: Royal Chundu Lodge. 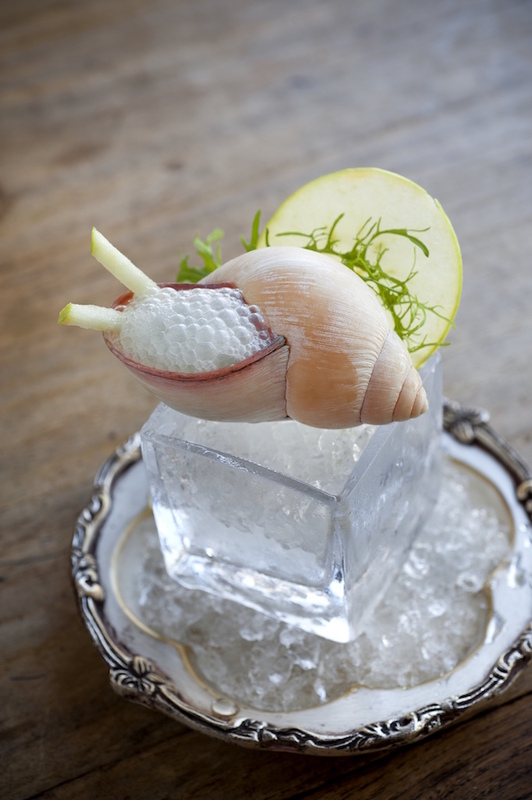 Having apprenticed under a Michelin-starred chef in one of South Africa’s top restaurants, Sungani has brought a disciplined sophistication to the local ingredients about which he is passionate. Each course had a wild element, whether animal, vegetable, fish or fruit, but the one that made him most proud was the dessert. Sungani created Sour Milk Cheesecake with Musika Jelly, which on his Tasting Menu he paired with a port. “Zambia’s first official dessert,” the server said, setting it down before us. “Enjoy!” Which we did. Enormously. 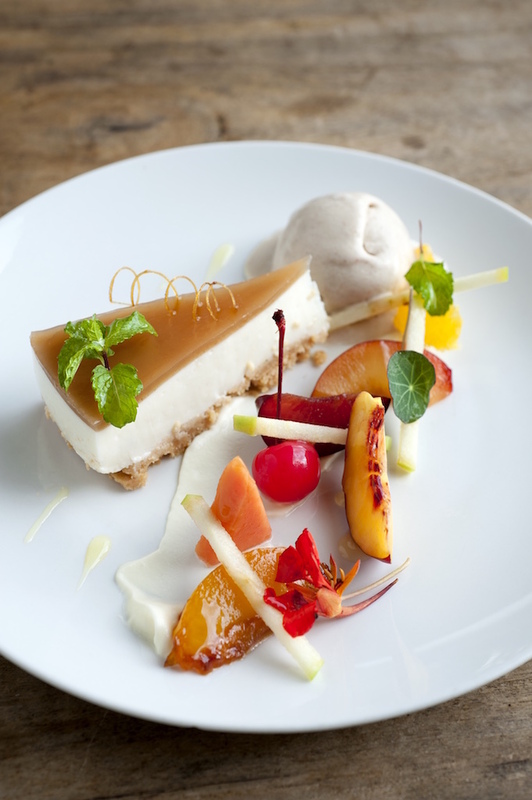 Sungani Phiri’s Sour Milk Cheesecake with Musika Jelly. Photo credit: Royal Chundu Lodge. Wonderful as always – well done Annabel! Thank you so much, Chitaiti. It’s a lovely place to write about! Great photos and story. Makes me wish I was there now. Haven’t been to the falls in a staggering 30 odd years. How did that go by so fast? By the way Annabel do you grow custard apples where you are? They are in all the shops here in Spain at the moment so if you want some seeds just say. I sent some to friends on the S Natal coast where they grew really well. Your climate sounds like it would be perfect for custard apples. Thank you, as always, for your great comment, Gillian. It is a really special area, of that there is no doubt. Email your postal address and I will pop some in the mail to you. gillyclaire@gmail.com I will need your surname too probably. I’ll send them from the UK going end of next week. My mum was born and grew up in India and she was crazy about custard apples from her time there. So whenever she found any in Zim we would be treated with them. I cannot say no. Your journey continues! I can hear the “thunder” and imagine the tastes and aromas! What a fascinating post: such an unexpected mixture of nature’s wonders and a degustation menu under an ancient tree . . . Methinks there is a worldwide move to the use of ‘native’ foods – penning this from Eastern Australia I know how much more we learn about and use our own ‘bush tucker’ [food] every year passing . . . I do not think I would ever dare to reside where you do, but am strangely envious of the beauty . . . Thank you so much for this thoughtful and kind comment, Eha. I think there is a desire, at least among people from countries about which I am familiar, for a simpler, less wasteful, lifestyle. In parallel, there seems to be a growing desire for connection to the earth, and wild food and foraging is a natural derivative. In my own instance, I’m blown away by all the wild edibles here … and, of course, the creativity they induce in the kitchen! My good friend Eha Carr sent me a link to your blog, thinking I would like it. I am so thrilled she did. I love everything about your blog–the writing is fabulous (retired literature teacher here, who loves your literary quotes), heart-warming stories, and terrific recipes. Thanks so much for sharing with the world.